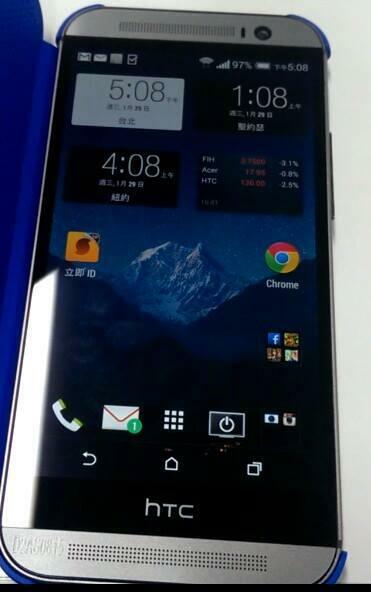 I don’t feel like the the purported HTC M8 (One follow-up) leaks are going to slow down any time soon. With Samsung preparing to announce the Galaxy S5 in weeks, HTC can’t be far behind with their next flagship. And with that, we get pictures like the one you are seeing below from @HTCFamily_RU. According to a Tweet sent along with this image, you are looking at an almost-crystal-clear image of the One’s successor. The device resembles a phone that has been leaked a couple of times, and as was hinted at by @evleaks, looks a heck of a lot like the One. It appears to be slightly more rounded, but the overall design theme is identical. You have dual BoomSound speakers, a potentially wide-angle front camera, big beautiful display, and a massive black bar which houses an “HTC” logo. Wait, we’re looking at on-screen navigation buttons, but HTC thought we still needed a massive black area for their logo to shine through? Since nothing is confirmed, we’ll withhold our remaining judgement on that area until something is made official. Other than all of that, it looks like Sense. It looks like an HTC phone. And it’s also sitting pretty in some sort of a flip case.